Rich: Since 2011, he has been one of the leading You Tube strategists in the online video industry. His company, Video Creators, has been featured by Fox, Forbes, BBC, even YouTube themselves, as his team trains creators and brands to master You Tube and use it as a place to spread messages that change lives. Their clients have organically grown by over 14 billion views and 61 million subscribers under their guidance. Today he lives in Cincinnati, Ohio with his wife and seven children. I’m pleased to introduce Tim Schmoyer. Tim, welcome to the show. Tim: Hey, thanks for having me, it’s good to be here. Rich: I read through that but I missed the part where you have seven kids. You’ve been busy. Tim: Yeah, I don’t miss that part. They’re constantly reminding me that they’re there. Rich: What’s the age range for those seven kids? Tim: We had seven children in 8 years. Tim: Yeah. Our oldest right now is 9, and our youngest is just turning 1. There was a period in there where we had four children ages 2 and under. It was crazy. Rich: Are they all single kids or are there any twins in there? Tim: We have one set of identical twin girls. So when the twins were born that gave us 4 kids ages 2 and under. And we still had a kid that was 1 year old and one that wasn’t quite 2 yet. Wait, she was 2. So we had a 1 year old, a 2 year old, and one that’s 3 about a month after the twins were born. Rich: I’m just thinking seeing that your wife changed her name, you have increased the Schmoyers of this planet by 8 times. 800% increase! Tim: Well I’m one of six kids, and they all have four or five kids. My sister has eight children now, so she’s got more than us. Rich: But she’s not a Schmoyer by name anymore, I’m guessing. Tim: Not anymore, no she’s not. I don’t think any of us planned it that way, there’s nothing super religious about it or anything, we just kind of ended up having them. Rich: You enjoyed it and you just kept on having more of them. Tim: Yup. And now we’re done. Rich: Well now that we know that, how did you get started with YouTube? Tim: It was back in 2006, I had moved halfway across the country and I was in graduate school. I wanted a way to keep my parents and family and friends up to date with what I was up to in the pre-Facebook days. So I created a blog on WordPress and started using it the way that we mostly use Facebook today, just posting pictures and stuff I was up to. I started dating this girl and I wanted a way to introduce her to my family and friends back home, so I was introduced to this site called YouTube, and I thought this was way easier than trying to email a .mov file to people. I could upload it to the site and they just click ‘play’ and suddenly it’s downloading. So in 2016 I made a little 30 second video clip on an 8mm camera, I uploaded it and called it “test video”. I just wanted to know could I get the video footage off the camera and onto the computer to upload to YouTube. And that’s where it started. I figured it out and then I started making little videos of this girl, of us going out to eat, out to dinner and the movies, in the park just hanging out. And I posted those on YouTube – I think today we would know them as vlogs – but back then it wasn’t a word, it was just being awkward in public with a camera. So I would make those videos public and before long we got engaged and I put those there, we got married and a wedding video and our honeymoon video, first house, first job. We kinda just kept going and didn’t stop. In the early days of YouTube there was a lot of people trying to figure out what is going on in this platform. So there was a time when I got a little bit nervous because these were MySpace days, and if anyone knew who you were on the internet they’d hunt you down and kill you for some reason. So we started getting comments from people I didn’t know and I was like, who are you and why are you watching this video, this isn’t for you, who is “Catlicker69” and should I be concerned that they’re watching my video. So I started asking people where they were coming from and how they were finding my video and why do they keep coming back. I was a little bit nervous and a little concerned. And they said they didn’t know, so I thought I need to figure this out. So other people started asking them and word kind of got around that we don’t know how this works but this guy Tim Schmoyer is trying to figure it out so talk to him. So from the very early days of YouTube I ended up kind of on the industry side before there was even like an industry really. At the time I was a youth worker and we had 180 kids that we had been working with, which I loved, but we were doing around a million people a month on YouTube at that time and I was seeing the same stories of life changes and impact coming out of what we were doing on YouTube ad I was seeing coming out of our youth group that we were working with. So I did some other things, I was a blogger for two years, but then I was like I really want to reach people and change their lives and YouTube seems to be the place where that can happen most effectively. People weren’t committing suicide because of any videos we had published, there were marriages that were being healed, people were learning how to grow their channels based on advice I was giving them, and getting off of disability and starting to feel like they had dignity and value to offer to the world. It was just awesome. So I had a couple opportunities to do YouTube strategy in the early days for Disney, Warner Bros., Century21, Budweiser, ebay, and a lot of those big brands. So I just happened to end up on the industry side and today we have a full team of about 10 of us that just love working with creators and brands helping them grow their audiences on YouTube, not just for the sake of views or money or subscribers and popularity, but ultimately using those things as tools to reach people and change their lives. So it’s been a lot of fun. Rich: Well that’s a great and uplifting story. It sounds like you’re creative and it sounds like you’re working with a lot of people who YouTube is the focus of their attention. And my only question is, I’m sure there are a lot of listeners out there who say that’s great if I wanted to make $1million on YouTube, but to be honest I’ve already got a business. Is YouTube good for people who are just running day to day businesses, or is it only good for people who are going to put their entire focus on YouTube? Tim: Oh yeah, totally. I just had a consultation earlier today with a company actually that have 3 or 4 brick and mortar stores in the Boston area, and they sell baby gear like strollers, playpens and car seats, things like that. So in our session they said, “Tim, you can work so well for us”, they do reviews of this gear and then they tell people if they have questions about it they can call us or email us and we respond to every single person. And he said YouTube alone has generated hundreds of thousands of dollars for us just this past year, and they and to blow up YouTube now so how do they do that. So yeah, absolutely, for any type of business. Rich: Alright, and it sounds like they’ve got the #1 concern that I think a lot of people do. That is, if I’m going to take the time and effort to put videos up to YouTube – and I’m a marketer as opposed to just a creator – I want people to see those videos, how do I make sure that people are going to find my video whether it’s on baby strollers, or piloting drones, or cooking? So what are some of the trick, I guess? Tim: Yeah, I’ll show you how to hack the system. Let’s dispel a few myths first between what people think it is and what a lot of people still teach that it is – and it hasn’t worked this way for years – but it’s still out there. Which is that a lot of people think if they just get the right keywords in their title and into their description and use the right tags and repeat my keywords enough times that the caption file picks up in it, it just eventually has to convince YouTube that this video really is about this work I’m using lots of times. And YouTube is smart, they figured out that just because you repeat your keyword 15 times that it doesn’t necessarily mean that video is the best result for that keyword. So they haven’t used keyword matching in a really long time. So what a lot of people do is they take what they understand about Google SEO – like on a website – and they kind of just bring that over to YouTube. Because I think that while they’re owned by the same company and their processes and systems should probably be similar, but the answer is no, not really at all. If you go to Google.com all you see there is their logo and a blank search box. That’s it. If you go to YouTube.com it’s littered with videos. If Google does their job well on their search platform, you spend no more than maybe 3-4 seconds on their site before you’re off someplace else. On YouTube it’s the opposite. There’s tons of videos in front of you, and yes there’s a search bar at the top, but it’s kind of like a secondary thing and our goal here is to actually keep you on our platform as long as possible. So they have opposite goals, are designed very differently, and to take SEO stuff from one platform and transfer it to the other doesn’t work that well. Does that make sense? You can’t just copy one form the other. Rich: Right. So like you said, they have opposite goals, and what we want to do is have probably different types of approaches. So Tim, if these two platforms are different – Google is trying to basically get you where you’re going, YouTube wants you to hang around a little bit – and because of that we need to have different approaches, what do you recommend and how should we approach that in terms of trying to get more visibility, specifically on YouTube? We’ve all heard that YouTube is the 2nd most popular search engine out there. Tim: Yeah, it is. And it actually is the 2nd most popular website now, six months ago it beat out Facebook, Google being #1. So I think what we need to do is really understand what YouTube’s goals are, and they have three primary goals for the type of content that they service and they types of videos that they promote to people, they’re looking for certain things. So number one they want to know what videos bring people back to YouTube. And they want to know what videos should we put there on the Homepage so that when someone is coming to YouTube this is what they’re looking for and this is what’s going to get them into a viewing session. What videos are those? Number two, they want to know what videos do people watch when they’re actually here. In terms of analytics, that’s measured in watch time. So are people watching this content or that content, and if so, then how much time are they spending on this video versus that video. And then number three, the thing we’re looking for is which videos keep people on YouTube the longest? And so the goal here is we want to get a viewer back to YouTube, put videos in front of them that they’re going to watch, and serve them content that’s going to keep them here the longest. Rich: I have to say – and this is me just being ignorant – why are those three different types of videos? Those sound like they should be all the same videos. And I know, I come to YouTube almost every day and there’s always a bunch of videos explaining some kind of superhero cartoon comic to me – because that’s the kind of stuff I love – but those then area also the ones that turn up in the side panel and those are the ones that I watch that are sometimes 15 or 20 minutes long. Tim: Yeah, you’re right. I should clarify that every video should help them accomplish those three goals. Tim: Yeah. So they’re not three separate types of videos, they have three goals and they’re looking for videos to help them accomplish those three things. So does that make sense? Tim: So there’s a lot of things in analytics that we can measure, but the main thing I want to point out about these goals is that they all revolve around how the viewer responds to the content itself. They’re all based on viewer signals. They’re not necessarily based on keywords and titles, although those things are important and Google asks for those information and they do make a difference. But it’s more because the person is expecting to see certain words when they’re looking for certain content, more than it is about the actual keyword itself. So a lot of people lie in their metadata. They’ll use different keywords and things because they think it has certain things like a higher search volume. So they use it thinking that they’re more likely to be positioned better for that. But you can make a video about a dog with a title, thumbnail, and everything that’s about cats, and Google is still going to figure it out that it’s about a dog because they’re going to notice that only dog people are watching it and cat people don’t like it. So they’re going to figure that this video must not be for the cat people, it must be about a dog. They’re going to figure it out based on who is watching, what their search history is, what their viewing patterns are, what they watch, and they’re going to start learning what the content is. So what we need to do is optimize our content to really do a good job in giving Google the signals that they want in order to know how to position our content. Rich: Google or YouTube? And I know that they’re the same company, but…? Tim: Yeah, you’re right, sorry. I’m using them interchangeably, but specifically YouTube. Now Google does position videos in their search results, but typically around search periods that tend to require visual results in nature. So the way we can help you meet those goals and get discovered is a few things. And there’s kind of a lot that goes into this, but let me see if I can go through this kind of quickly. And please feel free to stop me and jump in on anything that you want me to clarify or talk more on, Rich. Tim: There’s three things. So how do we get people to come back to YouTube? Well, the easiest way to do that is to let people know when they can come back to YouTube for your next video. It’s having a schedule, it’s having a predictable rhythm of when you’re going to publish something and people know when that is and so they can just make your content part of their weekly rhythm. That’s how television does it, they communicate very clearly when you should be in front of that television set to watch your next episode of whatever, and they want you to make their content part of your weekly rhythm. And so we need to do that, too, as creators so they know that it’s Monday so there’s a livestream with Tim, or it’s Thursday so I can catch up with this other creator. So they know that every Thursday they sit at their desk and eat lunch while catching up on YouTube with this guy’s videos. That’s the easiest way to get people back. Rich: Before we jump into that second thing I just want to say, obviously I get consistent “same bat time, same bat channel” sort of thing, but are there other benefits to having people on an email list or reminding them that your video has gone live, and does that figure into the algorithm as far as you know? Tim: Well, having the email list can really be helpful because it’s another way to get the viewing sessions started on YouTube. So if you have an email list you can absolutely email your list with, “Hey, here’s my latest video, don’t forget to check it out.” I tend not to do that for every video, I do that for just the big videos that I really want to push and I’m really excited about. Because I want people on the email list to know that if they get an email about one, that it’s a big one. So I tend to do that personally and it gives me a little extra juice to help push that video, so to speak, because there’s a larger than normal volume of people who are coming and starting their session with that video, and so that’s a little bit more of a positive signal to Google when I do that. Rich: So like people, YouTube or Google is also looking for a nice launch. So the bottom line is, if you’re trying to drive a lot of visibility for your videos, that there’s certain times that you’re really going to want to make a strong push. Maybe through email, maybe through social, but that can impact not just your immediate views but it also sends a signal to YouTube that this is a good video that they should be surfacing, as you’ve used the word before. Rich: Ok, cool. So I think you were about to jump into that second category of things that YouTube is looking for. Tim: Yeah, so the next thing we need to do then is we need to get peoples to actually watch our content. So get them back to YouTube, but then YouTube wants to know what videos they watch when they come back, and that relies pretty heavily on several different things. The title on the email is of course where they start their viewing journey. They see the title and the thumbnail hat pitches or teases some sort of value or a story that they’re interested in. Just create some intrigue or a question mark that the brain needs to have satisfied in order to move on with their day. So they’ll click and watch for those reasons. But then what we have to do is we need to hook their attention and keep them watching. And this is the problem of a different channel I met with earlier today. They were getting straight into the meat of the content and the videos weren’t performing very well. And it’s like, I’m watching your content but I don’t know why I should care about this topic. You haven’t told me what the reward is I’m going to get. Just like when you’re marketing anything, you focus on the reward and value rather than the features and things. So the videos were just going straight to the meat. And I said first of all, if I watch this for 3-4 minutes, I get to figure out why this is valuable. But most people are not going to give you 3-4 minutes to figure that out, you’ve got to tell them immediately right up front that here’s what this video is about and here’s the reward and value you’re going to get from it. These connect to a title and thumbnail that they clicked on, which set an expectation, and then you need to deliver on that right away that the value you clicked and expected to get is coming in this video. So then you can welcome people, do a branded intro, things like that. But the first 15 seconds are super important to hook in the viewer and get what’s called “watch time”, which is the total accumulated amount of time people spend watching your video. The more watch time you get on your content, the more that video will perform and the more likely Google will be to surface it because it’s giving Google a positive signal that this is a good video that people are spending a good amount of time watching. Rich: Alright, that makes a lot of sense. A quick question though, I know in the old days a lot of the advice was to create short videos. Like, if you’ve got 10 minutes of content, really what you have is three short videos and then string them together with links and stuff like that. But it seems now that the idea is longer content seems to be winning the day. Is that true? Tim: Yes and no. Yes it’s true if you actually hold someone’s attention for the duration of the video. So just because you make the video longer, doesn’t necessarily mean it’s going to perform better than a 2 minute video. A 10 minute video doesn’t outperform a 2 minute video if people are only watching 2 minutes of it. So if people are watching it for a little bit and then abandoning it, that’s not helpful. You have to think of, if you have a 2 minute idea, take 2 minutes. Don’t try to stretch it to 10 because someone told you 10 minutes would work better. If you have a 10 minute idea, don’t try to cram it into 2 minutes because someone told you that a 2 minute video works better than a 10 minute video. So it really comes down to serve the viewer the best way possible, and if you can only hold their attention for 2 minutes, just do it for 2 minutes. If you can hold their attention for 30 minutes, do it for 30 minutes. I think the other way to interpret that is, people in general are becoming more and more used to watching longer content online than they used to, and so longer content is becoming more and more successful as people sit down and have longer and longer viewing sessions online, as opposed to their viewing habits 10 years ago which used to be much shorter. Rich: That makes sense. Alright, well you also talk about videos that keep people at YouTube, or is that kind of what we just addresses. Tim: No, no. The next one is really important because , which is television. So they come to YouTube and then make a video based on what they’re familiar with – which is television – and they put it on YouTube and they wonder why it doesn’t work. The two platforms perform very differently, the viewer has different expectations, one is called a “lean in experience”, on YouTube people are leaning in on their desktops and phones and not distracted, they’re just very focused. Where television is called a “lean back experience”, because people are just passively watching. Typically they have the iPad on their lap, they’re eating or talking to someone else in the room, and just leaning back and sharing a much more passive experience. And so that’s why that first 15 seconds is really important. When it comes to keeping their attention and keeping them on YouTube longer, what we need to do number one is first get their attention, number two, delver really good value or a really good story that keeps their attention so they actually get to the end of our video. And this is where we can use some of YouTube’s tools such as Endscreen and the interactive elements there to get people to click and watch another video. So the mistake a lot of people make when they’re used to television, they’re used to people signing off and saying goodbye, “Hey, I hope you enjoyed this video, thanks for watching, we’ll see you guys again next time”, that’s how game shows wrap up. But on YouTube all of that sends a really clear signal to the viewer that this video is over and you can now safely abandon this video, there is no extra additional value coming to you. Rich: Nothing to see here. Tim: Yes. Be on your way. And that’s the opposite of what we want. We actually want them to keep watching. And on YouTube it doesn’t have to be over the way a television show is over on TV. So instead, at the end of your video you get 20 seconds to show these Endscreen elements that are interactive that people can click and do a playlist or watch another video. And so what we need to do instead is, you get 20 seconds to show these things. The first five-ish seconds should still be the creator delivering content. The viewer should still be there when those endscreens finish. If you just tack them on to the very end of your video, it doesn’t matter because no one is watching at that point anyway. So you’re still showing some content, and then instead of wrapping it up and doing all of your “goodbyes”, and “see you laters”, and comment belows, and “subscribes”, and all those call to actions that people go through, instead it should be something that gets people their next piece of content. So if we’re making something educational, for example, like in my case maybe I’ll do something like teaching people how to get more views. So at the end of that video you might say – if you have a mobile audience – is how to optimize your thumbnails for mobile viewers, “Click right here on this video you see on your screen. We’ll take you guys over there and we’re going to dive really deep into how to optimize for mobile, and I’ll see you over there.” And then the video ends. So when I say, “Hey guys, click this video you see on your screen”, I’m pointing to it in the recording and I’m giving a quick little pitch and I’m not saying goodbye, only I’ll see you in the next video. So what I’m doing is using a sales tactic that says if you talk about the product from the perspective of the customer has already made the purchase, they are much more likely to actually make that transaction if they’re picturing themselves with it. So I’m doing the same thing. Instead of saying “goodbye”, I’m saying I want you to picture yourself already getting this next video content. For our clients, we’ve gotten that click through rate up to as high as 38% for some of them, when it’s a really solid pitch to the next video and clicking. And so now that video got great watch time, now their next video is getting great watch time, the video after that. And as you start growing a library of content on your channel that just does this, the whole channel starts to take off. Rich: Ok, let me play a little devil’s advocate here, because I know that you’re a creator and I know that you’ve got a great conference that focuses on YouTube creators. I’m going to be a selfish marketer, if I’m loading up a video on YouTube I don’t care if YouTube gets a lot of view time, I just want that person to come visit me at my website. So from my standpoint, yeah it’s great I guess if you want to watch another one of my videos, but really I want you to come to my website and buy something and fill out a contact form. Am I punishing myself on some level if my focus is to get people off of YouTube and back to my website where they can make a buying decision? Rich: Ok, so that is kind of a tricky thing because I don’t care if they watch more of my videos because – although that’s nice – it doesn’t necessarily affect my bottom line if I’m a marketer versus a creator. Do you have any thoughts on how we might be able to balance those two things if we are primarily marketing on YouTube? Tim: Yeah, absolutely. So that’s what I told a guy earlier today, his calls to action were all about getting people to go to their website and buy the product that he just reviewed. And that’s fine, you can do that. But the question I asked him was, when you do that you’ll have a higher conversion rate, but would you rather convert 1% of a million viewers, or 10% of 1,000 viewers? And those are obviously fictitious numbers, I just made them up. Rich: I was about to say, are those the same numbers? I’m terrible at math, I don’t even know if the final number is the same. Tim: Well I think one is 10 times higher than the other. Rich: You could be right. Tim: But the point is, for him at a million, he’d be outranking everyone in his niche, in his industry. And he’d be the #1 guy to go to because he’d be surfacing for everything because he’d capitalizing on the long game as opposed to the short game. Yes, if I keep ending the viewing session I’ll make another sale, but after that video passes through my subscribers that made that sale, my video is not going to really be surfaced anymore. So I put a lot of energy into making a piece of content that’s not really performing for me long term. What if instead I just made a video that continued to grow and grow and people were constantly passively being introduced to my brand, being introduced to my value proposition, and people started seeing me as a thought leader in my industry. And you can still convert, but what I told him to do is let’s have a conversion thing as a lower 1/3 – just show it visually – at the beginning of the video and at the end. So he’s trying to get people to call him, for example, or email his business. And so I was like, let’s instead of making that the pitch at the front, we looked at his audience retention graphs and YouTube will show you exactly how people responded. And what we saw was that when he would do the pitch at the beginning, people would just skip over that. Infact, he lost 40% of his audience by doing the pitch in the very beginning. And furthermore, you could see the audience retention graph would just drop, and then it would go for about a minute or so and then it would go back up again at the point where he started talking about the product. So people weren’t even watching his call to actions at the beginning, or even taking him up on it. All they said basically what just show me the product. Rich: Right, because otherwise it feels like a bait and switch for the viewer. Tim: Yeah. So what we did was think about this as more a part of your customer journey, not necessarily like you’re a salesman. So we’ve got to open it up with a strong visual of the product with some voiceover of you talking about what’s about to come up in this content and why it matters to the viewer. And then introduce yourself and while you do that show a lower ⅓ that says if you have questions call or email us, but don’t spend another 27 seconds trying to get them to call you, just show it visually and keep going. So the idea is, instead of losing 40% of our audience in the first minute of the video, what if we can tighten this up and get straight to the value. Let’s say it only drops in haf next time, now we’re only losing 20% of the audience. Well now we just doubled the potential performance of that video. So at the end of the video he’s still going to make a quick pitch like, “If you feel this is the product for you, there’s a link in the description below. If you have questions, feel free to reach out to us, we love to make this as simple for you as possible. In the meantime, we have this video for you here…”, and now he’s pitching the next video. So he made the pitch, he let the viewer know it’s there, but for the person that’s ready to buy, they know how to move forward. But for everyone else who was just looking for a review and now they’re done, he’s getting them into another video. So his pitch is really quick and mostly associated with visuals. Rich: And I can see this because really I have only a small percentage of people that are actually going to buy from us, so if we’re sending all those people away, we’re teaching YouTube that we have a dead end as far as videos go. But if we’re getting the bulk of people to move to the next video, they’re going to keep people flowing through that lane of traffic, so to speak. Tim: Yeah. And so you think of the video not as the goal of video is to sell, necessarily. The goal of video is to get someone exposed to your brand and the product in the first place. 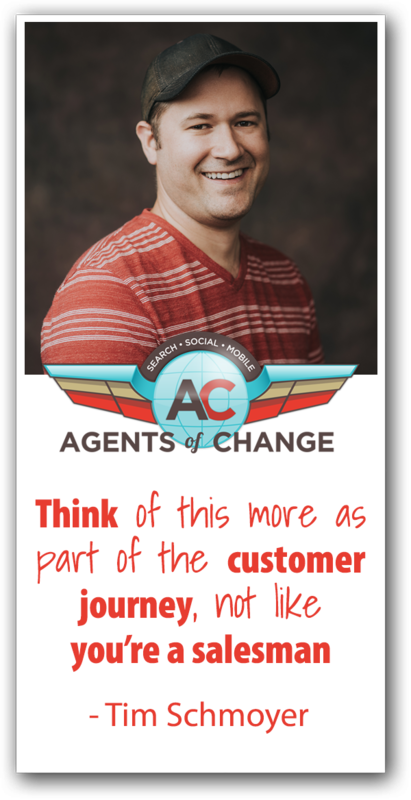 Then you move them along a customer journey. And for me, my customer journey and the next transaction I want them to take is actually just to watch another video. I just want you to get more value from me and I want you to do this for free, and I want you to just keep watching and help my channel perform well, but I also want to blow you away where you’re to the point where if you need help with your YouTube stuff, Tim obviously knows what he’s talking about so I’m calling him. So people know how to get in touch with me, my link is in the description, I reply to comments, it’s easy enough to find and it’s also visually there on screen. There’s another way to do it that’s to actually think about how you create content more like an email marketing funnel. And the way we do this, in email marketing we start with a lead magnet. You give away something for free, something of high value, in exchange for an email address so they sign up. On YouTube we’re going to call that “discoverable content”. This is stuff that people don’t know or care about who you are, they just clicked on the video doe to nothing else than the title and the thumbnail tease to value or a story that they’re interested in, and they clicked on that. And then through that content now they’re being introduced to you, your brand, your story and they think it’s really good and they grow to like you or your company. And now you start to grow the “know, like & trust” factor, which is typically the next 2-3 emails in the introductory email sequence. So those would be what we call community content/community videos on YouTube. So these are videos that are crafted intentionally to just engage the existing audience we already have on our YouTube channel. So discoverable videos can be the lead magnet that brought them in and turned them into a subscriber. And the community content takes that subscriber and gives them information they wouldn’t have even have known to search for, so they’re thankful they’re subscribed to that channel. Or behind the scenes or personal things that aren’t going to go big, but the goal isn’t to go big, it’s just to continue to grow the community and the know, like & trust factors with an audience you already have. And then from there then you do a sales video, which would be like the last couple emails of your email sequence which would be a pitch for a sale. And I typically do maybe one or two of these a month where I’ll post a video that now just capitalizes on what the discoverable content brought in, what the community content did, and now growing trust and things here is an offer that I’m offering you. And I’ll out that up and post it and let it go for about a week or so. It’ll go through my subscriber’s feed and probably after a week or so it’s no longer getting any views because it’s effectively ending the viewing session, which is exactly what I want it to do. And then I’ll just make that video unlisted and go on and rinse and repeat. And that can work very effectively, too. So there’s a lot of different ways to do it. Rich: That’s an interesting technique, I had not heard that before. Tim: Does that make sense, that process? Rich: Yeah. Definitely a little bit of extra work, but I think that that’s an interesting approach and I haven’t seen it being used, so I’m kind of interested in trying that out. Tim: Yeah, that’s the way I’ve been doing it for myself for years, and for me it makes sense because my audience is on YouTube. There’s a lot of businessmen and small business owners that want to learn YouTube but aren’t looking on YouTube, ironically. But primarily my audience is on YouTube and so that funnel makes sense. All I’m doing is my customer journey doesn’t start with my email list, it actually starts with my YouTube channel. So I have like three extra steps before they actually get to my email list in the first place. Tim: And then I just treat it like an email list. Rich: Fantastic. Tim, this has been enlightening. Really good stuff. I’m sure there are people who want to learn more about you, hear about your conference, check out your stuff online. Where can we send them? Tim: I actually have my own podcast at Video Creators, you can search iTunes or Spotify, SoundCloud, wherever you listen to your podcasts. We do a weekly show there that just dives into some of these types of topics for YouTube creators and for entrepreneurs and small business owners. And you can check us out at videocreators.com. Rich: Awesome. Tim, thanks so much for your time today and for stopping by. Tim: Yeah, thanks for having me, it’s been fun. Tim Schmoyer teaches businesses and creators how to leverage the YouTube platform and use it to help build brand awareness, gain customers and retain them for the long term. Check out his podcast where you can learn how to create YouTube magic for yourself.